There’s no better way to greet a new born baby into the world than with flowers! 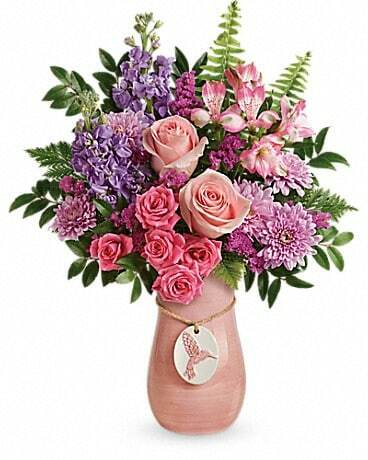 Surprise a new baby girl or baby boy with a cheery bouquet from Peachtree Florist. We can deliver your wonderful new baby gift of flowers to Peachtree City, GA.
At Peachtree Florist, our reliable staff is committed to creating beautiful flower arrangements and gifts which are perfect for any occasion. As a trusted local florist, we offer flower delivery throughout Peachtree City, GA and surrounding areas, as well as nationwide delivery through our network of reliable florists. Peachtree Florist also offers convenient same-day floral delivery for all of your last minute gift needs! Make the right impression with fresh flowers from Peachtree Florist. Find the perfect floral gift for any holiday or occasion - from lovely Mother’s Day flowers and romantic anniversary flowers to sympathy funeral flowers and thoughtful get well flowers. Trust your local Peachtree City GA florist for the freshest, most beautiful bouquets to fit any budget. Peachtree Florist offers the best arrangements gifts for the ones you love, like special birthday flowers and exquisite Valentine’s Day flowers for the ones you love. 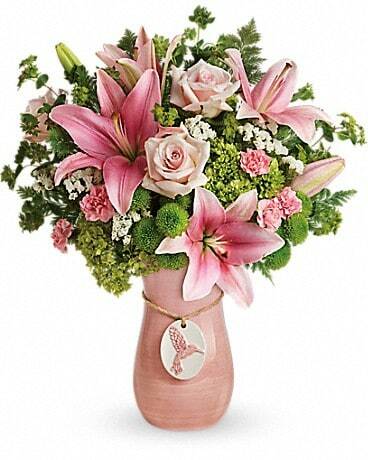 Peachtree Florist can deliver beautiful floral gifts in Peachtree City or anywhere nationwide. Pick out the perfect flowers on our website and conveniently order online or over the phone. Our florists will expertly arrange your bouquet of fresh flowers and can even create a custom gift basket for our special occasion. When you choose Peachtree Florist, your trusted Peachtree City florist, your gifts are sure to please. For the best, freshest flowers in Peachtree City, Peachtree Florist has exactly what you’re looking for. Check out our wide selection of gift baskets and plants to find the perfect present for your next special occasion. Flowers from Peachtree Florist are expertly arranged and hand-delivered to each recipient. For the best local flowers in Peachtree City GA, look no further. Sometimes ordering online can come with unexpected results. For instance, some of the national floral sites which ship your flowers unarranged in a plain cardboard box. Is that what you’re looking for when you order a gift for your friends or loved ones? Peachtree Florist strives to do better which is why you can trust us for fresh, hand-arranged flowers that are personally delivered to your recipients in Peachtree City or anywhere nationwide. Don’t take the risk – trust Peachtree Florist. Peachtree Florist in Peachtree City, GA provides flower delivery service to the following areas and zip codes in Georgia: Our shop serves the following areas in Georgia: Fayetteville, Newnan, Peachtree City, Sharpsburg, Senoia, Brooks and Tyrone.